The Verkhovna Rada of Ukraine has appointed Stepan Poltorak to the post of defense minister at the request of President Petro Poroshenko. A total of 245 MPs voted for Poltorak's appointment at a parliamentary sitting on Tuesday, October 14. The parliament also dismissed Valeriy Heletei from the post of defense minister. 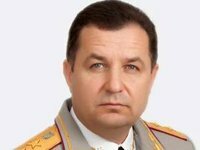 Ukrainian President Petro Poroshenko accepted the resignation of Valeriy Heletei from the post of defense minister on October 12, and nominated Stepan Poltorak, commander of the Ukrainian National Guard, for this post on October 13. Colonel-General Stepan Poltorak was born in 1965. He became commander of the Ukrainian National Guard on March 19, 2014. He was commander of the Ukrainian Interior Ministry's Interior Troops for the period between February 28, 2014 and March 12, 2014.